Above - Chairman and Managing Director: Oswald Stoll. And Marshall Moore: Chief of general staff and stage producer. THE London Coliseum is something entirely new in theatrical enterprise. In extent, design, and decorative features it has been described by the leading newspapers as a palace of pleasures, colossal and magnificent. 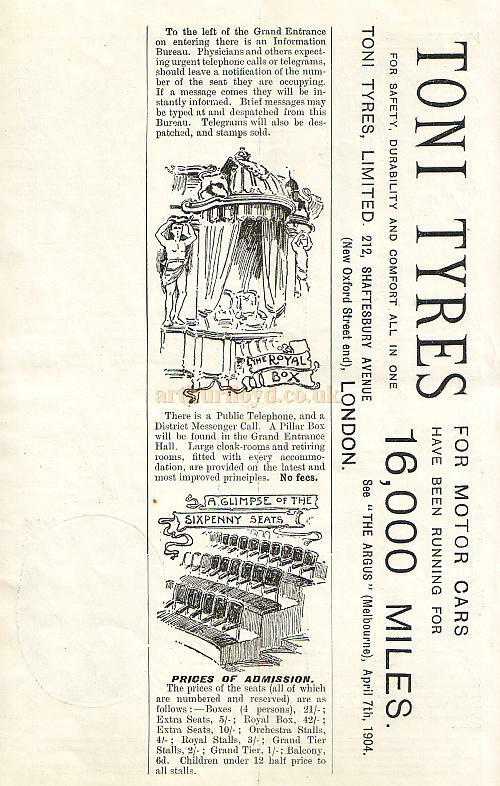 By means of the triple electric revolving stage, invented by Mr. Oswald Stoll, grand spectacular effects, which would be impossible without this novel aid, are produced. All roads lead to the new playhouse in St. Martin's Lane, for the theatre is close to and visible from Charing Cross. It occupies an area of about an acre. The stage weighs 160 tons, and is over 10,000 square feet in extent. Its three revolving tables can be turned at a speed of over 20 miles an hour. Beautiful gold and coloured mosaics and magnificent marble and alabaster are the chief features of an imposing decorative scheme. Above the Great Tower, on which bold carved figures represent Art, Music, Science, and Literature, is an iron revolving globe, about twelve feet in diameter, from which 500 electric lamps spell out to the public the word - "Coliseum". Above - WALTER SLAUGHTER: Director General of Music. 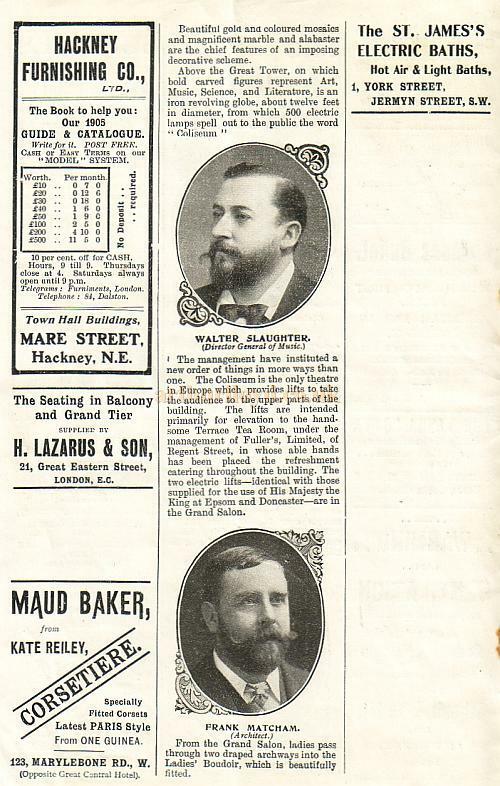 And FRANK MATCHAM: Theatre Architect. The management have instituted a new order of things in more ways than one. The Coliseum is the only theatre in Europe which provides lifts to take the audience to the upper parts of the building. The lifts are intended primarily for elevation to the handsome Terrace Tea Room, under the management of Fuller's, Limited, of Regent Street, in whose able hands has been placed the refreshment catering throughout the building. The two electric lifts-identical with those supplied for the use of His Majesty the King at Epsom and Doneaster-are in the Grand Salon. From the Grand Salon, ladies pass through two draped archways into the Ladies' Boudoir, which is beautifully fitted. Through the Grand Salon is the Royal entry. Immediately on entering the theatre, a Royal party will step into a richly-furnished lounge, which, at a signal, will move softly along on a track formed in the floor, through the salon, and into a large foyer, which contains the entrance to the Royal Box. The lounge car remains in position at the entrance to the box, and serves as an ante-room during the performance. Above - E. WINGFIELD BOWLES: Consulting Elecltrical Engineer. And The Terrace Tea Room. Large openings divide the Grand Salon from the Grand Staircase. From the ground floor or entrance level the marble staircase is continued down to the large Baronial Smoking Hall, for the use of all parts of the house. 2. Canary & Company - The Comedy Juglers will present "Fun in the Kitche." 3. The American Comedy Four - A Quartette of Vocal Fun Makers. 4. A Comedy Song Scena, entitled - "Mr. Watson." by Frank Leo. 5. The Stud of Cantankerous and Educated Ponies - Introduced by Mr. Boswell. 6. 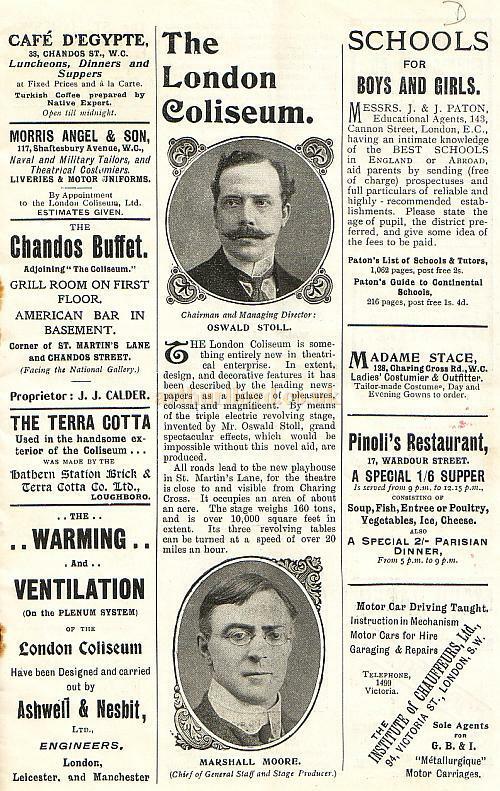 The Amusing American Comedy Duo - Wilson and Waring. 7. The Sensational Comedy Arial Act performed by - The Cee Mee Troupe. 8. A Children's Nursery Scena - "My Gollywog." Invented and arranged by Will Bishop. 9. Marvellous La Loie Fuller - In the grand Musical Mystical Dances - 1. The Flight of Butterflies (Radium) 2. The Dance of 1,000 Veils. 10. The Meister Glee Singers - In Their Inimitable rendering of Part Songs. 11. Illustrated Song - By the Coliseum Choir. 12. Grand Musical Spectacle - Port Arthur. Above - Grand Tier Tea Room, Balcony Tea Room, and The Information Bureau. There are spacious tea rooms in every tier - the Terrace Tea Room (in which the Cecilian Orchestra performs a selection of Music from 11 to 12, 2 to 3, 5 to 6 and 8 to 9), Grand Tier Tea Room, and Balcony Tea Room. There are also Confectionery Stalls and an American Bar. Dainty Snacks at moderate charges can be obtained all day in the theatre. Five o 'clock tea between the three to five and six to eight performances will be a speciality. The Terrace Tea Room (which is for the use of Private Box and all Stall patrons) can be reached by the Grand Staircase, or by lift from the Grand Entrance. The Grand Tier Tea Room (on the left of Grand Tier) is on the Grand Tier Staircase. The Balcony Tea Room, on left of Balcony, is on Balcony Entrance Staircase. In each tea room there is a kiosk (Ticket Office and Information Bureau) where seats for the next performance and transfer tickets are to be obtained. Above - The Royal Box, and A Glimpse of The Sixpenny Seats. To the left of the Grand Entrance on entering there is an Information Bureau. Physicians and others expecting urgent telephone calls or telegrams, should leave a notification of the number of the seat they are occupying. If a message comes they will be instantly informed. Brief messages may be typed at and despatched from this Bureau. 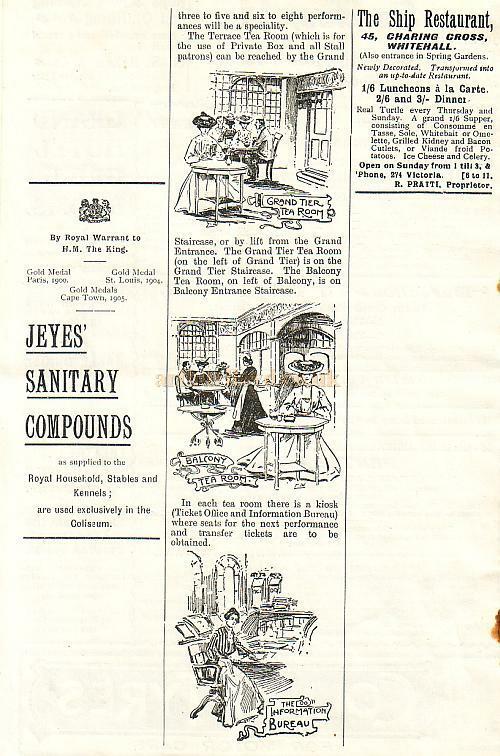 Telegrams will also be despatched, and stamps sold. There is a Public Telephone, and a District Messenger Call. A Pillar Box will be found in the Grand Entrance Hall. Large cloak-rooms and retiring rooms, fitted with every accommodation, are provided on the latest and most improved principles. No fees. The prices of the seats (all of which are numbered and reserved) are as follows: -Boxes (4 persons), 21/-; Extra Seats, 5/-; Royal Box, 42/-; Extra Seats, 10/-; Orchestra Stalls, 4/-; Royal Stalls, 3/-; Grand Tier Stalls, 2/-; Grand Tier, 1/-; Balcony, 6d. Children under 12 half price to all stalls. All the seats are comfortable, richly upholstered, and provided with arm rests. Every seat in the house is numbered and reserved, and can be booked in advance. There are four performances daily, and each lasts exactly two hours. The first commences at 12 o'clock noon. The second commences at 3 o'clock p.m The third commences at 6 o'clock p.m. The fourth commences at 9 o'clock p.m. The first and third performances are alike; so are the second and fourth. During the one hour intervals between the performances, a band will play in the Terrace Tea Room. 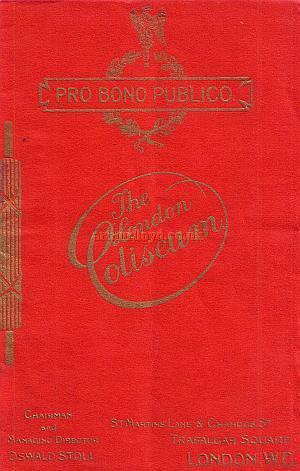 Articles found by visitors to the Coliseum should be left in the Business Offices on the Royal Stalls tier. Enquiries for articles lost should be made at the above offices. The Management will be greatly indebted if Ladies wearing large Hats would most kindly remove same in order not to obstruct the view of the Stage of Patrons seated behind them. N.B.-There Is no Fee of any kind In the Cloak Rooms. Are sold subject to the right of the management to make any alteration in the performance which may be rendered necessary by illness or through other unavoidable causes. In the event of incivility or inattention on the Part of any of the staff, complaints should be addressed to the Acting Manager, Mr. John Donald. 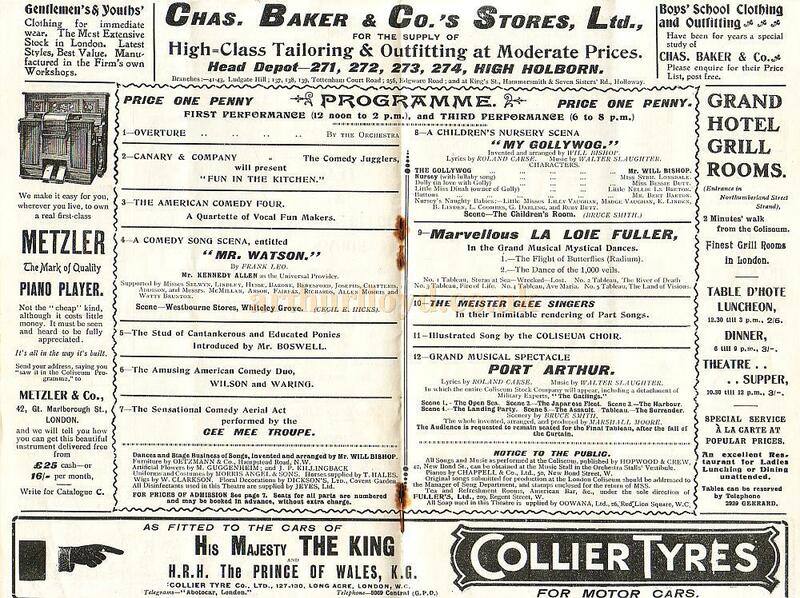 All enquiries re advertisements in this programme should be addressed to Dixon & Hunting and the Farringdon Press, Ltd., 180, Fleet Street, E.C., Printers of this Programme. 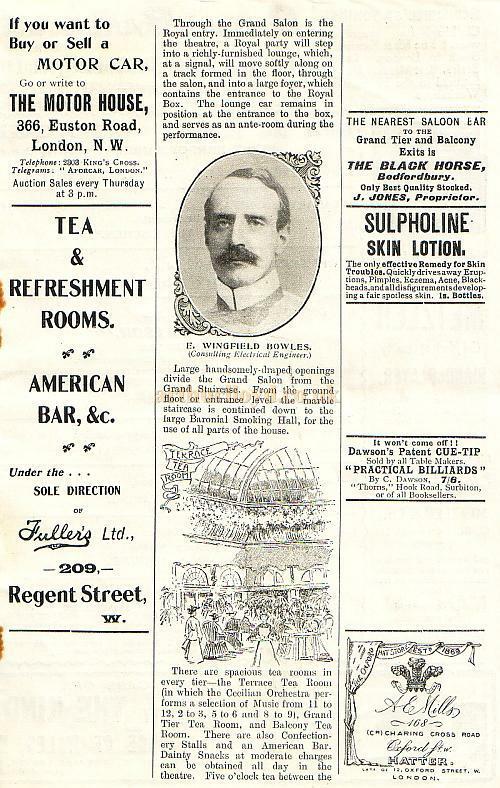 Chairman & Managing Director - OSWALD STOLL. Chief of General Staff and Stage Producer - MARSHALL MOORE. Acting Manager - JOHN DONALD. Assistant Acting Manager - SIDNEY DAVIS. Press and Literary Departments - TROMAS COATES. Conductor of Orchestra - MAURICE JACOBI. Sub - Conductor and Leader - J. VAN HEUVEL. Chorus Master - ROWLAND WOOD. Stage Manager - FRANK HARRISON. Master of HORSE - SYDNEY H. ASH. Scenic Artist - CECIL E. HICKS. Advertising (other than Press) Manager - H. HAWBEY. Box Office Manager, A. W. NORRIS, to whom all letters for booked seats should be addressed. 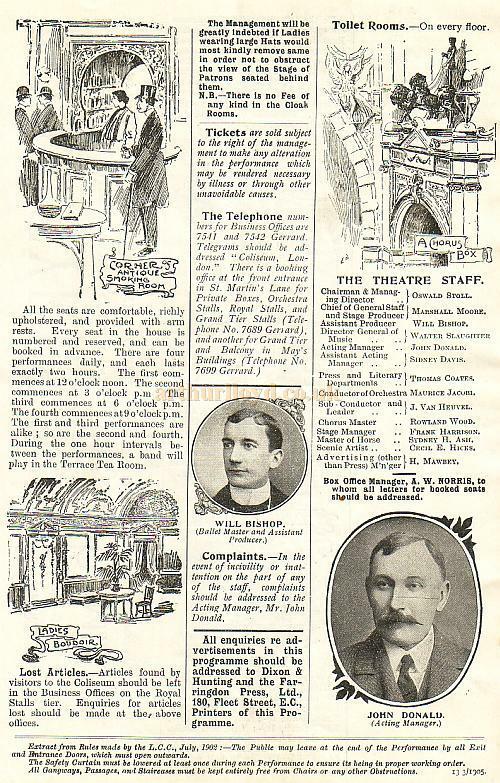 Pages and details from a very early Variety Programme for the newly built London Coliseum in March 1905 with details of the Theatre, it's designers, and facilities.